You know those spine-tingling breath-taking make your heart melt fairy tale love stories? Well this house has one, only it really happened, and YOU can supply the happy ending if you are in the market to purchase a house, or know someone who is. It’s a common belief that there is an enormous difference between ad “house” and a “home.” The story behind this property, located at 10438 Madison Street, was a spark that was bright enough to turn this house into a home, already full of love. The story begins over 20 years ago when Leah, a child with Down syndrome, moved into the house with the rest of her family. Shortly thereafter, another child in the neighborhood, Mark, who also happened to have the same condition, befriended Leah. They were inseparable, until a few years later when Mark was forced to move to Texas due to his parents’ careers. Sadness and heartbreak ensued for both Leah and Mark. During this most recent Christmas, Mark showed up at Leah’s doorstep – a Christmas miracle? Perhaps. Regardless, Mark shared the news that his parents were being transferred back to the Omaha area, and he wanted to stop by and visit Leah. At this moment it became apparent that Leah and Mark were destined for one another. Even after nearly 20 years, the two emanated a feeling of love that couldn’t be denied by anyone in the room. 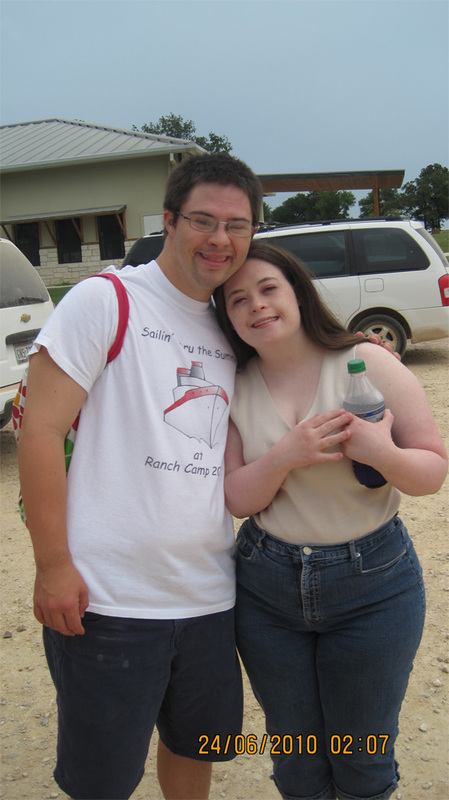 Mark had been living in a community home specializing in the care of adults living with Down syndrome in Texas, called Down Home Ranch. Arrangements were made soon thereafter for Leah and Mark to be married, and live as a happy couple at Down Home Ranch. Then, it was all a matter of time before they were man and wife. The story doesn’t end there. As an even larger gesture of love, Leah’s parents decided to pack up and move down to Texas and act as a local support system for the two newlyweds. Even after taking out an additional mortgage, contributing sweat and money into a second addition on the home, and maintaining perfectly good careers in Omaha, Leah’s parents, Mike and Cindy, sacrificed it all to show their love and support. This isn’t some ploy to get a buyer to fall in love with the house – let’s be real, it may be a magical love story, but is it enough to sell a home? The answer is: it is just an even larger indicator that the home with bring good fortune, especially with a brand new addition, beautiful granite countertops, tons of space (four or five bedrooms) and a full rec room and media room… incredible! This house probably doesn’t even need an amazing story of love and sacrifice to help get it sold, but it anyone who has a heart can see that Mike and Cindy are people who are willing to give up everything for people they love, and who wouldn’t want to be surrounded by good karma like that? This story just goes to show that true love is never lost, and people are good at heart. Help this family out by taking a look at their amazing property. Furthermore, donations are always needed and welcome at both Down Home Ranch (http://www.downhomeranch.org/), as well as the Omaha Down Syndrome Parents Network (http://www.odspn.org/). As always, if you have any question at all, or are interested in the home, feel free to contact me by phone (402.680.2500) and anytime by email at bill.black@cbshome.com.